Showing 1–8 of 8 items. GO KEYLESS. 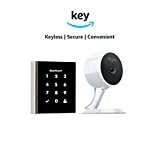 Lock and unlock your home with ease using the touchscreen keypad or use the Key app. Never worry about lost, misplaced, or duplicate keys. WATCH OVER HOME. 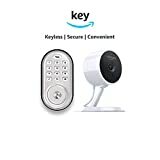 Easily monitor and control your front door from anywhere. Connect with the Cloud Cam to see who comes and goes with 1080p HD video, night vision, and two-way audio. WORKS WITH ALEXA. 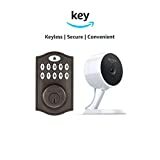 Enable the Key smart home skill and ask Alexa to lock/unlock your door. Or ask Alexa to show Cloud Cam's live feed on your Amazon Fire TV, Fire Tablet, Echo Show, or Echo Spot. EASY TO INSTALL. Compatible with doors that have a standard deadbolt mounted separately from the handle and have a thickness of between 1-3/4" to 2-¼." The door also needs a 2-1/8" door face bore hole and at least 1" door edge bore hole. ENHANCED FEATURES. Create up to 250 pin codes for your family and friends, or grant one-time access for your dog walker. Or use the touchscreen, weatherproof keypad which features backlit numbers that won't wear off. 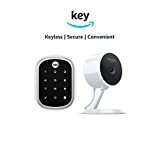 Includes 9V battery backup, tamper resistant battery cover, privacy button for all code lockout, weather protection gasket and quiet motorized deadbolt. OPTIONAL IN-HOME DELIVERY. Prime members in select areas can opt-in to get Amazon packages securely delivered right inside their door. You can even watch the delivery live through the app or view a video clip of it later. ENHANCED FEATURES. Create up to 250 access codes for your family and friends, or grant temporary access for your dog walker. Weatherproof keypad features backlit numbers that won't wear off. Includes 9V battery backup. GO KEYLESS. Lock and unlock your home with ease using the Key app or use your physical key. EASY TO INSTALL. Compatible with a standard single-cylinder deadbolt mounted separately from the handle/knob below it and on doors between 1-3/8" to 2" thick. Works with most Kwikset, Weiser, Baldwin, and Schlage standard deadbolts. MAKE YOUR DOOR SMART. Transform your existing deadbolt into a smart lock in minutes with just a screwdriver. 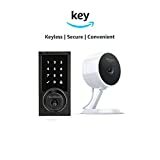 Ideal for renters - keep your existing external deadbolt hardware and use your existing keys, only replace your current lock's interior hardware. EASY TO INSTALL. Compatible with doors that have a standard deadbolt mounted separately from the handle and have a thickness between 1-3/8" to 2" thick. ENHANCED FEATURES. Create up to 30 access codes for your family and friends, or grant temporary access for your dog walker. 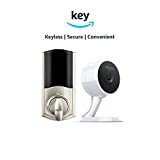 SmartKey Security designed to protect against break-ins and keep your family safe, while also allowing you to re-key the lock yourself in seconds. ENHANCED FEATURES. Create up to 30 pin codes for your family and friends, or grant one-time access for your dog walker. 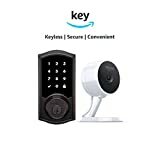 SmartKey Security is designed to protect against break-ins and keep your family safe, while also allowing you to re-key the lock yourself in seconds. ENHANCED FEATURES. Create up to 250 access codes for your family and friends, or grant one-time access for your dog walker. The durably acrylic buttons have backlit numbers that won't wear off after use and are easy to see at night. ENHANCED FEATURES. Create up to 30 access codes for your family and friends, or grant one-time access for your dog walker. Patented SecureScreen technology prevents user code detection via fingerprints on the touchscreen. Uses a 9V battery as a backup power source to illuminate the touchscreen for code entry in case the 4 AA batteries run out.